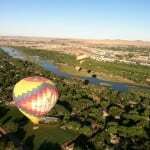 Up, up and away to Albuquerque, the hot air balloon capital where high desert golf is booming and a rich list of diverse cultural activities take boredom out o f the English language. The Sheraton Uptown is minutes away from it all with the best bedding to rest after a long fun day. Take the Historic Old Town Trolley first for an entertaining open air introduction to all the neighborhoods and sites to decide which you want to explore in detail. Starting in the plaza, it tours along the historic Route 66, noting preservation of architecture in theaters and gas station conversions to diners, Bart Prince’s fantastical designed spaceship featured on Extreme Homes, a castle and elephant sightings by the zoo. The mayor, popular with all parties says, “We don’t tolerate diversity, we celebrate it.” The Petro glyph National Park and the Indian Pueblo Cultural Center show off Native American lifestyles. Spanish influence delivers Flamenco, interpretive theatrics marrying tap dancing with graceful yet dramatic moves in response to clapping, Moorish influenced music, singing and Oles. Mexican food is unmatched at El Pinto where the ambience is as great as the chili manufactured on the grounds of the restaurant. Seating 1000 there is still a wait on weekends. For Italian cuisine, don’t miss Torino’s at Home owned by husband and wife team, Daniela and Maxime Bouneou. She is the vivacious Italian hostess and he the award winning French chef. This is fine dining at its best, all fresh ingredients in authentic dishes to be savored slowly. Mayor Berry also says, “We have enough stuff, we need more experiences.” Like golf? The elusive and subjective rating system of golf courses around the globe, dominates major publications. Albuquerque will heighten anyone’s passion for playing highly rated courses. Number one Paa Ko Ridge transforms a wooded mountainside landscape with emerald fairways, dense forest canopies, and extreme undulating greens. The optical illusion of slopes mystifies the best of green interpretation, causing one to ponder what just happened. “How could it break that direction?” Take the partially dirt, switchback road (not for the car sick passengers) over the Sandia Mountain to the arroyos of Twin Warriors Golf Club. En route, stop for a ride on the longest tram in the world to a height of over 10,000 feet. Summer hiking, winter skiing or relaxing in the restaurant all dish up dramatic scenery. At Twin Warriors, play beside Indian cultural mesas with a serene view of the western slope of Sandia, the Spanish word for “watermelon,” as the sunsets paint the mountain with hues of red and pink. A Gary Panks signature design with Pinion Pines and Juniper frame the grassy knolls that wind through canyons and hills along the sacred butte known as Tuyuna or “Snakehead.” In fact the whole serpent outline can be seen mol ten in the rock spanning several holes. The 19th Wind Dance Bar and Grill serves a foot long dog like no other, butter flied and smothered with onions and red or green chilies. Pair it with their special “Markarita” to toast the round. Sandia Golf Club and Casino Resort lies at the base of the majestic Sandia Mountains. This Scott Miller design is one of the longest in the state at over 7700 yards from the tips. Ample fairways offer subtle changes in elevation as it winds itself around the casino property with outstanding views of the high desert. Often awarded by Golfweek and Golf Digest as one of the Best to Play, the always immaculate condition of the course, provide an unbeatable combination with discriminating golfers. Managed by OB Sports, the resort hosted three weddings the day we played. Before a round, early birds should call Rainbow Ryders who know, unlike Dorothy’s wizard, how to safely float you through the skies in a gondola box with a hot air balloon. The International Balloon festival is held here annually for good reason. 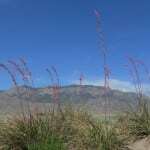 The climate is ideal and the views are surreal over the Rio Grande. Traditional celebratory toasting is done with local champagne after landing. If you love ballooning, check out the colorful balloon museum covering the history of use in sports, war and aerospace science. Aero and Outer Space is a recurring theme in New Mexico. Famous for the Roswell crash site of an alien spacecraft, New Mexico has a special relationship with anything galactic. The leap of faith by the people of Sierra County is building the first public spaceport for the future. Virgin Atlantic has successfully launched two orbital flight aircraft and will soon be the first private firm to transport the public into space to look back at earth. This business arm is called Virgin Galactic. Tours are available from Truth or Consequences; a town that looks like it was preserved from the fifties and appears to be inhabited by no one yet has another great Italian restaurant Café Bella Luca. For years we have rushed through Albuquerque, stopping for lunch or dinner and hitting the road without knowing the fun to be had. Micro breweries abound as many highly awarded brew masters create their own styles. Ales, porters, IPA’s and lagers are the preferred varietals. New Mexico’s climate and high altitude has also developed numerous wineries. Fertile soils along streams and valleys introduced an artistic taste for wine connoisseurs. New Mexico’s legislature has established a friendly environment for the television and movie industry. Movies like The Avengers, Beerfest, and Transformers along with TV’s Breaking Bad are filmed in Albuquerque. Currently, Johnny Depp is filming the Lone Ranger, starring as Tonto. There’s just no time for chilling in the land of chilies. Red or green, every day is like Christmas. On future travels, we will spend more time at the Bio Park, extend the stay at Twin Warriors, lavish in the spas, and visit Explora! (a “transactive” hands on museum), tour wineries and of course play more golf on all the Santa Fe Trail courses mentioned in addition to Santa Ana Golf Club, Isleta Eagle Golf Course, Towa Golf Resort, UNM Championship, and one of our very favorites, Black Mesa Golf Club. Gorgeous accessible courses with challenging layouts and unique vistas make you want to return even as you are flying home. With 310 days of sunshine, if only we could wish, “Beam me to Albuquerque” and have it come true. Perhaps Virgin Galactic will figure that out too. This is not “any town USA”, it’s a trip. Go to http://www.itsatrip.org to plan your unique vacation.